Corbeau Reclining Seat - Baja XRS UNIVERSAL - Pann Auto Performance - San Diego largest aftermarket automotive performance parts - What do you drive? The Baja XRS Suspension Seat is one of the most anticipated seats ever to be offered to the Jeep, Truck, and Off-Road community. You probably saw our advertising campaign asking enthusiasts to help us come up with the ultimate reclining suspension seat. When you combine our years of expertise in aftermarket seating with thousands of designs from enthusiast across the country, you come up with what is hands down the best reclining suspension seat on the market. 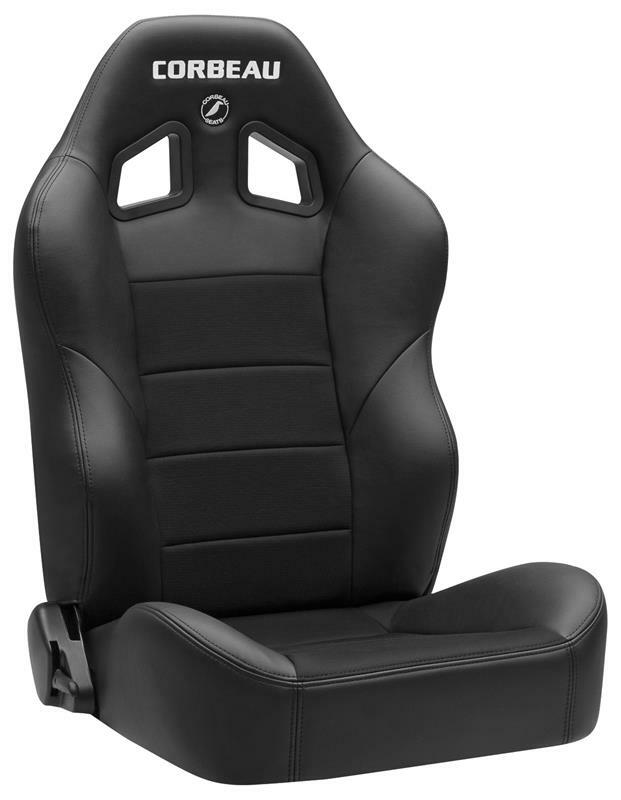 Most reclining suspension seats look the same, with the XRS we have added a little style and practicality. The Baja XRS combines injection molded memory foam with our suspension technology. Most suspension seats use a low quality cut foam, which over a short period of time will soften and wear to the point that your back and legs will pay the price. The Baja XRS on the other hand uses injection molded memory foam, which combined with our suspension technology, will provide unmatched comfort and support for years to come. The Baja XRS Suspension Seat is a direct bolt-in to CJ and YJ Jeeps and will fit in any other vehicle with Corbeau custom brackets. The Baja XRS will fit up to a 42 inch waist, while still comfortably fitting smaller drivers. The Baja XRS is available in all black vinyl or a black vinyl/cloth combo.